With Jimi having acted as foil for much of Mirrodin Besieged, it’s Sam’s turn to get back in the hotseat and do battle with the preconstructed decks. Everyone has a favourite world, and Sam’s is Alara. From the book to the mechanics to the cards, she’s a huge fan of the block and a natural choice to take lead against me. For the match, Sam opts to go with Naya Behemoths, hoping to win the attrition war in the red zone through that deck’s massive beaters. Here are our notes from the match. After a first turn of playing land (Sam a Forest, me a Mountain), Sam lands a turn-2 Wild Nacatl and a Naya Panorama. I trot out the early parade of expendables with a Dragon Fodder. Next turn, Sam cracks the Panorama for a Plains, and the now-2/2 Nacatl swings in for early damage. Happy with the advantage, Sam’s number is up when I drop a second Mountain and summon a Thunder-Thrash Elder, devouring both goblins to make him a 7/7. Although it took two cards to do it (the Fodder and the Elder himself), the aggression pays off and Sam’s immediately on the defensive. Now turn 4, Sam adds a Cylian Elf to her board, but it doesn’t look to solve very much. I swing in for 7 with the Elder, then shore up the home front with a Goblin Piker before passing. Looking uncomfortable, Sam casts a line with Gift of the Gargantuan and hits! Revealing a second Wild Nacatl and that critical third basic land (a Mountain), she’s in much better shape. She summons the Nacatl, but must hold on to the Mountain as she’d already played a Forest. Sam then attacks with the Cylian Elf. Normally I’d let him through this early in the game, but I’d prefer to keep Sam’s options restricted and trade it out for the Piker. That way, Sam has less options for gang-blocking the Elder. With more than enough life to shrug off a crackback, I send in the Elder for another 7, taking Sam to 6 life. Sam drops the Mountain on turn 6, and now both Wild Nacatls are 3/3’s. She adds a second Mountain with Rampant Growth, then sends in one of the Nacatls to drop me to 15, and stabilises her board quite nicely with a follow-up Woolly Thoctar. The pendulum is slowly starting to swing the other way, especially after my turn 6 is a blank. Next turn, Sam adds a Naya Battlemage and second Woolly Thoctar, holding off on the attack to make the next one more profitable. In dire straits, I drop a Thorn-Thrash Viashino without devour, a simple 2/2 chump blocker. Back to Sam for turn 7, she taps my Elder with the Battlemage and swings with the team. I offer up the Viashino to a Thoctar to leave myself at 4 life, but Sam closes the deal with Blaze. Leading off with a Mountain, I watch as Sam gets out another quick Wild Nacatl on turn 1. Repeating last game I then follow up with a second-turn Dragon Fodder, but let the Nacatl through when Sam drops a Mountain and swings for 2. Instead, I look to play the aggressive game and swing back with my goblin tokens for 2 of their own and pass. Sam attacks again with the Nacatl, which gets blasted with Shock. She taps out and tries to console herself with a Naya Battlemage, but I Shock that as well. 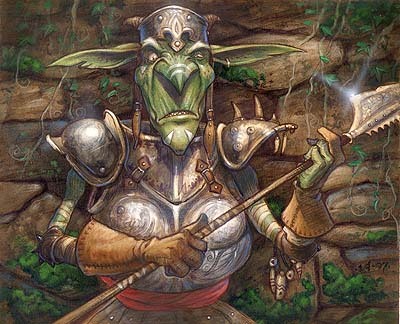 Now turn 4, I play a Savage Lands for some mana fixing, swing for 2 with the goblins and summon a Hissing Iguanar. Her options diminished, Sam can only play a Forest before passing. I swing in with the team for five on the following turn, then follow up with a Sprouting Thrinax. Sam’s turn 5 is a complete blank, without even a land drop to show for it. She’s off of Plains, and it’s obviously impairing her. I swing in again on turn 6, taking her to 3 life. She draws, then scoops. On the play, Sam leads with a Forest and Wild Nacatl, and seems to have the Devil’s own luck for drawing them early. All I have is a Mountain, but with a Shock in hand I’m well pleased with the lead-off. Next turn sees Sam pump the Nacatl as expected with the playing of a Mountain, then she swings in for 2. In two games I’ve seen enough of these to know that they need to die early and often, so I tap for the Shock right away. Sam facepalms when she goes to follow up with a Rampant Growth to get a Plains (which would have made the Nacatl a 3/3), but is mollified a moment later when she realises that I would have just responded to her sorcery with the Shock anyway. An odd sequencing, but no misplay. Back to me, I play a Swamp. Although she’s hit her full shard’s worth of land (one of each type), she nevertheless misses a turn 3 land drop and has nothing to play. As luck has it, I’ve also hit mine, and have a turn-3 Sprouting Thrinax to show for it. Sam topdecks a Jungle Shrine on turn 4 and plays it, while I swing in for first blood for 3 with the Thrinax before following it up with the Hissing Iguanar. The Shrine’s done well for Sam, for that and another Forest give her the base she needs to get out a Rakeclaw Gargantuan. Knowing this will be my last ‘free shot’ before she has mana available to give him first strike, I swing in with both critters confident she’ll decline the trade. She does, and drops to 11 life. I then land an Obelisk of Jund and pass. Happy to sit back and recover, Sam’s turn 6 is a blank, but she’s forced to advance my board state when I opt to swing in with the Thrinax. Am I bluffing, or do I really have something with devour in my hand? She taps a mana to give the Gargantuan first strike, and pushes it in the Thrinax’s path. My Thrinax bursts open (pinging Sam for 1 from the Iguanar’s special ability) and yields a trio of 1/1 Saproling tokens. I then offer all three Saprolings to my incoming Mycoloth, giving it six +1/+1 counters and nailing Sam for 3 more damage (down to 7). Sam responds with a spiteful gesture by Naturalizing my Obelisk, which is more painful that she realises. As my sixth mana source, she just put me off my next-turn Flameblast Dragon unless I can draw a land. Sam’s turn 7 Gift of the Gargantuan might well be too late, though it does net her a Naya Panorama and a Woolly Thoctar. She plays the Panorama and passes. During my upkeep the Mycoloth generates a cluster of six more 1/1 tokens. I then swing in for lethal with the 10/10 Mycoloth, and unsurprisingly Sam chumps out the Rakeclaw Gargantuan. I then devour all six of the 1/1 Saprolings to make a robust Thorn-Thrash Viashino, and the Iguanar pings Sam another half-dozen times to leave her at 1. Even without the Dragon making an appearance, Sam is doomed. She draws her final card, and concedes. Devour is one of those ‘feast-or-famine’ kind of mechanics that has a high level of swinginess built into it. Although in the games above it was a smashing success, to be fair I was playing against Naya. 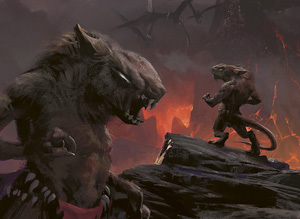 Had it been Grixis, with its increased facility for spot removal, the results might have been considerably different. In fairness to Primordial Jund, though, the measures it has in place to mitigate the potential card disadvantage worked very well here. Sprouting Thrinax and Mycoloth both generated ‘essentially free’ tokens to use for devouring, and even had the devouring critter I next summoned eaten a Doom Blade, I would have been no worse off. The deck synergised quite well with itself, and it frequently felt like there were lots of potential interactions available when I was planning how to deploy my opening draw. Having viable options makes for great gameplay through decision-making, rather than just the obvious “Play A. Then B. 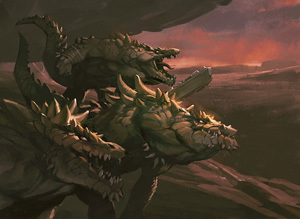 Then play C.” In particular, I noticed an interaction I had missed in the initial deck review with the Hissing Iguanar. When looking at the card as part of the deck, I predicted it would contribute through a “slow, steady drain of life on your opponent as the relentless march to the graveyard goes on.” That’s true, but what I saw once I played it was just how nasty it could be when devouring tasty gobfuls of 1/1 token creatures. Through its passive ability alone the Iguanar nailed Sam for 6 life in one turn in Game Three, and therein lies your decision tree. Do you try and get the Iguanar out before engaging devour, or do you instead race to get out a turn-3 7/7, as I did in Game One? There’s no wrong or right answer, and that adds to the deck’s replayability. The deck has the usual weakness of being light on removal, but overall was a lot of fun to play. Great review! This site has single-handedly made me excited about pre-cons again! Agreed. Would have never bought PvC if it wasn’t for this site. I’m sure this site will be the reason I buy my first intro pack. A red based tri-color deck with a light removal suite. So wrong. Still looks like it was a blast to play. Looking forward to the Grixis reviews. Never looked into many of the shards save Bant, so it’ll be nice to read as a prelude for the PW Duel Deck this year. 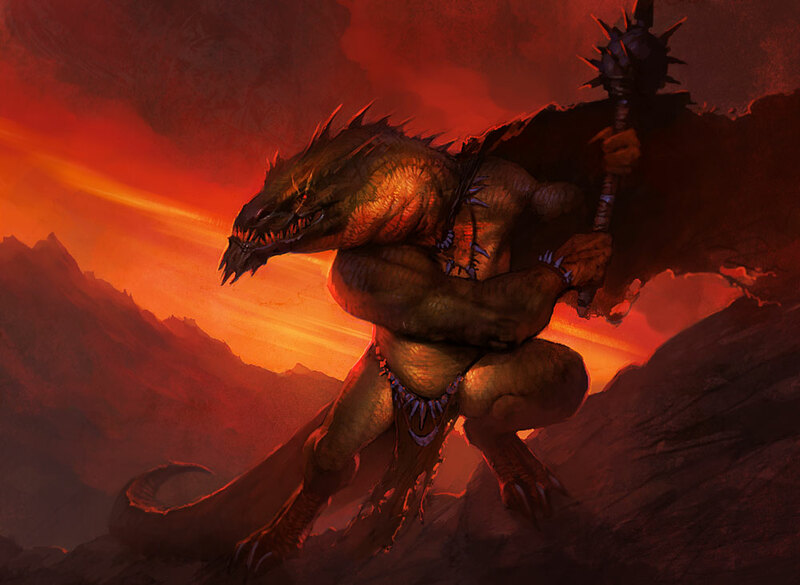 Grixis is right around the corner, and Bant hot on its heels! Well, I definitely like the rares in this deck. Flameblast is great and Mycoloth is awesome. I always enjoy the tension of options and a more complicated game state, but I know that many feel the opposite. Did you feel this tension excessive? More often than not I found myself facing the opponent filling the board while having to decide whether to put out an early blocker or accepting disadvantage for the moment while saving resources for the finishers. It’s usually a tough call with this deck what use to make of those early tokens … and it’s hard to resist the temptation of chumpblocking. I never consume everything with Devour. If I only eat 1 or 2 goblins, the elder is still huge and I have ammo for another, better critter. I feel like I was right about this deck. Naya is a bit of a bad example due to not being able to spot. Mycoloth will easily win if it’s early enough in the life totals to start churning out infinite token flood. If that had been shot there would have still been a rather close game going. Also, I also see how I saw none of our 2/2s or 3/1s. They aren’t what makes this deck, and not seeing them is something you probably should hope for :P.